Festival fever is well and truly upon us, and although I missed out on Glastonbury as I’m filming in the Big Apple, I’ll definitely be digging out the Hunters on my return as there are some awesome smaller UK festivals coming up I simply can’t miss. Last year top celebrity makeup artist Daniel Sandler created a gorgeous boho-style floral festival look for me, which you can check out here. This year I’ve enlisted Daniel’s help once more, but this time we’ve gone for something altogether different – a Gwen Stefani-esque party look that blends 90s grunge-glam and futuristic cool. Here’s how we did it. At a festival, you need makeup that will make your skin look fresh and radiant as well as last all day. Daniel recommended the Clarins BB Cream – the coverage is enough to conceal any pesky blemishes while still allowing your skin to breathe. It’s easy to apply too – simply blend into the face with your fingertips, making sure to take the product down the neck to avoid tidemarks. Daniel then loaded some of the Too Faced Glamour Dust Glitter Pigment in Pink Fire onto a smudger brush and gently dabbed it over my eyelids. The contrast of the shimmering lilac hue and the black eyeliner provides the perfect blend of girly and edgy. He also applied some to the tops of my cheekbones for a super-cool holographic effect and across my lips to create the illusion of a fuller pout. 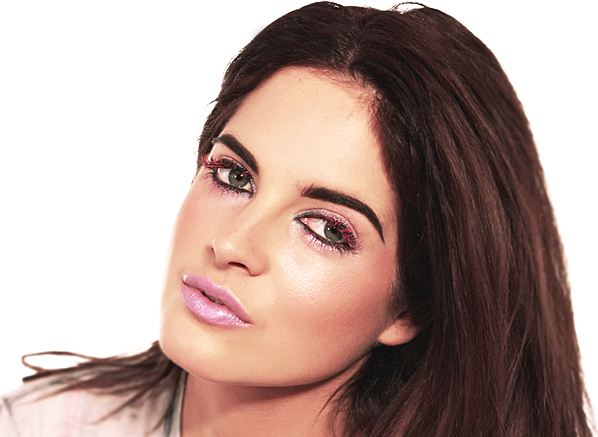 The mantra “less is more” certainly doesn’t apply to festival make-up – so feel free to go as wild as you like. A little does go a long way with this pigment, though! Instead of using a boring black mascara, Daniel decided to mix things up a bit and go for a vivid fuchsia shade – in the form of Dior’s Addict-It Lash Mascara – to really make the lashes pop. A statement look like this calls for suitably bold brows, so Daniel defined and darkened mine using his Brown Velvet waterproof eye pencil, sweeping the colour through my brows with a small brush for added volume. To give my skin a rosy-radiant glow, Daniel swept his Daniel Sandler Radiant Sheen Illuminating Face Powder across the apples of my cheeks. This pretty palette offers the perfect blend of golden and peachy tones to instantly perk up even the most hungover of complexions – plus the dark shade doubles up as a great contour colour. Finally, Daniel painted my pout with Guerlain Rouge G Lipstick in Gemma – a bold lilac shade providing a matte but moisturising wash of colour. Bioderma Photoderm Bronz Invisible Sun Mist SPF 50 – sunburn at a festival is no fun! This entry was posted on Monday, July 14th, 2014 at 10:32 am and is filed under Binky's Beauty Blog #BBB, Guest bloggers, Make-up, Swatches, Trends, Video. You can follow any responses to this entry through the RSS 2.0 feed. You can skip to the end and leave a response. Pinging is currently not allowed.